Most people have two kidneys. They sit at the back of the body in the loin, or flank, one on each side, just underneath the ribcage. They filter the blood to remove waste products, which they excrete into urine. Urine is carried from each kidney, through a narrow tube called the ureter, to the bladder where it is stored. As well as removing waste products, the kidney performs many vital functions, such as controlling fluid balance (how dilute the blood is), regulating various salts or electrolytes in the bloodstream (eg: sodium, potassium, calcium, magnesium), maintaining the correct acidity of the blood, and regulating blood pressure. Many different conditions can affect the kidney. Here we will discuss only those commonly treated by urologists. These include kidney (renal) cancer, kidney stones, and pelvi-ureteric junction obstruction (PUJ obstruction). Nephrologists also treat patients with kidney disease, but they deal more commonly with patients who have kidney failure and other kidney problems not requiring surgery. If the join between the part of the kidney that collects urine (renal pelvis) and the ureter is narrow, urine will not drain easily and may back up causing dilatation of the collecting system behind that point and enlargement of the renal pelvis (see picture). This dilatation of the collecting system is referred to as hydronephrosis. PUJ obstruction is usually congenital, but may also be acquired (i.e. secondary to other disease processes or previous instrumentation). A pyeloplasty is a surgical procedure that is indicated for a pelviureteric junction (PUJ) obstruction. 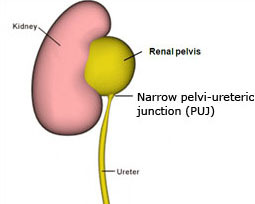 The PUJ is the portion of the collecting system that connects the renal pelvis to the ureter. The standard treatment for pelviureteric junction obstruction is open pyeloplasty. Many individuals with a PUJ obstruction do not realise they have this condition until later in life, when they begin developing symptoms such as pain or develop urinary infections. The aim of the surgery is to remove the narrowed portion of the PUJ and join it to the ureter in to allow for easy drainage of urine down the ureter. 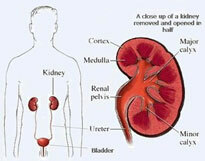 There are different ways to approach the kidney to perform the operation. These include via a flank incision, subcostal (under the rib) incision, transabdominal approach, or even sometimes through an incision in the back. Most commonly, however, this procedure is done using laparoscopy, or keyhole surgery. 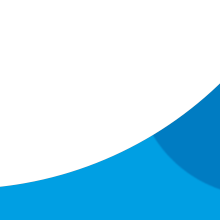 Laparoscopy is a technique of performing a surgical operation using instruments inserted through narrow hollow tubes (‘ports’) rather than through a larger incision, as in traditional surgery. The result is shorter hospitalisation and convalescence, often less bleeding and post-operative pain and fewer wound complications. 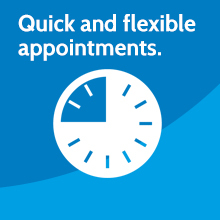 The main disadvantage to laparoscopic surgery is that it might take longer to perform. Also, there is a “conversion rate”, meaning that in some cases if the operation is too difficult or dangerous to perform through a laparoscope then the surgeon might decide that he needs to perform an open operation. Please click here to read more about the operation. 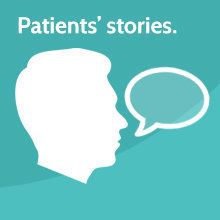 Patients often ask how they can prevent themselves from getting kidney stones. Our kidney stones page provides useful information regarding the formation and prevention of stones as well as dietary advice for kidney stones.